The weather is presenting a huge unknown ahead of the race, with a super-typhoon in the area but looking likely to miss the track and the race window. That doesn't mean it won't be wet though, and Red Bull have gambled on that by opting for a wet race setup, starting further down the grid. 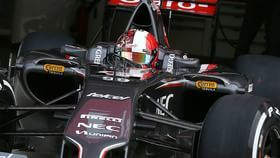 Maldonado and Vergne both take ten place grid drops after using their sixth engines, whilst Lewis Hamilton and Daniel Ricciardo hold their heads high despite crashing during the practice sessions. If the race goes ahead unimpeded, it should be a good one, so stay tuned!